Try adding 2/3 cup diced green peppers or other crunchy vegetables. Mix all ingredients together in medium-sized bowl. Chill for an hour to allow flavors to blend. 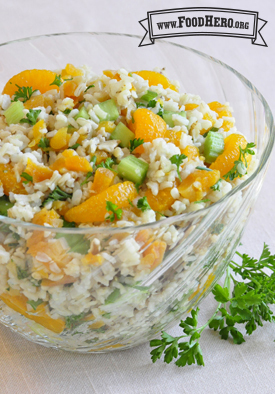 4 Comments for "Orange Rice Salad "
I have made this many times with 3rd graders. We prefer to not have the juice from the mandarin orange cans, but the rest we followed the reicpe and loved it! This is such a great recipe! We used this as our Thanksgiving "stuffing" this year and it was such a refreshing taste. It has bright color and stores well for leftovers. It also scales up really well for sampling at a food bank. I slice the mandarins into thirds so that each bite gets a little bit of orange instead of whole mandarin slices. Wonderful, very light for summer time. I really loved this recipe! Vinegar might add some more zest?? ?